Beautifully engraved specimen certificate from the Red Hat, Inc dated 2001. This historic document was printed by the Security Columbian Banknote Company and has an ornate border around it with a vignette of the company's Red Hat logo. This item has the printed signatures of the Company’s President and Secretary. Red Hat, Inc. is an American multinational software company providing open-source software products to the enterprise community. Founded in 1993, Red Hat has its corporate headquarters in Raleigh, North Carolina with satellite offices worldwide. Red Hat has become associated to a large extent with its enterprise operating system Red Hat Enterprise Linux and with the acquisition of open-source enterprise middleware vendor JBoss. Red Hat provides operating system platforms, middleware, applications, management products, and support, training, and consulting services. Red Hat creates, maintains, and contributes to many free software projects and has also acquired several proprietary software packages and released their source code mostly under the GNU GPL while holding copyright under a single commercial entity and selling user subscriptions. As of June 2013, Red Hat is the largest corporate contributor to Linux. In 1993 Bob Young incorporated the ACC Corporation, a catalog business that sold Linux and Unix software accessories. In 1994 Marc Ewing created his own Linux distribution, which he named Red Hat Linux (Ewing had worn a red Cornell University lacrosse hat, given to him by his grandfather, while attending Carnegie Mellon University). Ewing released the software in October, and it became known as the Halloween release. Young bought Ewing's business in 1995[clarification needed], and the two merged to become Red Hat Software, with Young serving as chief executive officer (CEO). Red Hat went public on August 11, 1999, achieving the eighth-biggest first-day gain in the history of Wall Street. Matthew Szulik succeeded Bob Young as CEO in December of that year. Before its IPO, Red Hat had received some funding from Joyce Young, the aunt of founder Bob Young. When Red Hat went public, she cashed in enough stock to recoup her initial investment, then left the remaining stock to linger, "for fun". Her return on investment was so great that, by January 2000 she was a millionaire, allowing her to donate CAD$40 million to the Hamilton Community Foundation in June 2000. On November 15, 1999, Red Hat acquired Cygnus Solutions. Cygnus provided commercial support for free software and housed maintainers of GNU software products such as the GNU Debugger and GNU Binutils. One of the founders of Cygnus, Michael Tiemann, became the chief technical officer of Red Hat and by 2008 the vice president of open source affairs. Later Red Hat acquired WireSpeed, C2Net and Hell's Kitchen Systems. In February 2000, InfoWorld awarded Red Hat its fourth consecutive "Operating System Product of the Year" award for Red Hat Linux 6.1. Red Hat acquired Planning Technologies, Inc in 2001 and AOL's iPlanet directory and certificate-server software in 2004. Red Hat moved its headquarters from Durham, North Carolina, to N.C. State University's Centennial Campus in Raleigh, North Carolina in February 2002. In the following month Red Hat introduced Red Hat Linux Advanced Server, later renamed Red Hat Enterprise Linux (RHEL). Dell, IBM, HP and Oracle Corporation announced their support of the platform. In December 2005 CIO Insight magazine conducted its annual "Vendor Value Survey", in which Red Hat ranked #1 in value for the second year in a row. Red Hat stock became part of the NASDAQ-100 on December 19, 2005. Red Hat acquired open-source middleware provider JBoss on June 5, 2006 and JBoss became a division of Red Hat. On September 18, 2006, Red Hat released the Red Hat Application Stack, which integrated the JBoss technology and which was certified by other well-known software vendors. On December 12, 2006, Red Hat stock moved from trading on NASDAQ (RHAT) to the New York Stock Exchange (RHT). 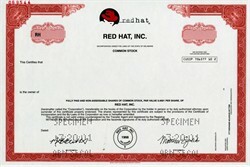 In 2007 Red Hat acquired MetaMatrix and made an agreement with Exadel to distribute its software. On March 15, 2007, Red Hat released Red Hat Enterprise Linux 5, and in June acquired Mobicents. On March 13, 2008, Red Hat acquired Amentra, a provider of systems integration services for service-oriented architecture, business process management, systems development and enterprise data services. Amentra operates as an independent company. On July 27, 2009, Red Hat replaced CIT Group in Standard and Poor’s 500 stock index, a diversified index of 500 leading companies of the US economy. This was reported as a major milestone for Linux. On December 15, 2009, it was reported that Red Hat will pay $8.8 million to settle a class action lawsuit related to the restatement of financial results from July 2004. The suit had been pending in US District Court in North Carolina. Red Hat reached the proposed settlement agreement and recorded a one-time charge of $8.8 million for the quarter that ended Nov. 30. On January 10, 2011, Red Hat announced that it would expand its headquarters in two phases, adding 540 employees to the Raleigh operation, and investing over $109 million. The state of North Carolina is offering up to $15 million in incentives. The second phase involves "expansion into new technologies such as software visualization and technology cloud offerings".